Like the three men who founded the winery, Kiamie Wine Cellars, combines the best fruit in Paso Robles to create a variety of the best blends. There is no doubt that the robust grapes of West Paso Robles' mountainside vineyards result in notable wines, especially when they are used to create the exceptional blends of Kiamie Wine Cellars. Kiamie wines are the product of a collaborative effort between three men who recognized that truly distinctive blends could be made from Paso Robles' very best fruit. Those three men are themselves a unique blend, representing different backgrounds in the wine business. They found each other after General Manager Greg Johnson, whose career began in a wine retail shop in New York, convinced his friend, businessman and California native Aram Deirmenjian, to move out west to help him start a winery. The two visited several wine regions in California and were most impressed with the fruit coming from the mountain slopes of West Paso Robles. Aram took a job at Halter Ranch in West Paso, where Steve Glossner was working as a winemaker. Steve, whose career led him from the Finger Lakes to Sonoma and then to New Zealand, discovered Paso Robles in 1993. In the very next year, Steve's first red blend for Justin Vineyards and Winery earned the coveted international Pichon Longueville Comtesse de Lalande trophy for the best blended red wine. When Greg, Aram, and Steve met in the vineyards of Halter Ranch, the triumvirate was formed and Steve began blending small lot wines for Kiamie Wine Cellars. 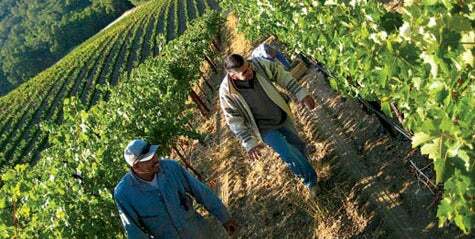 They source grapes from premium vineyards within a two-mile radius on Paso's west side. Their efforts have not gone unnoticed. For example, the 2007 Kiamie White Kuvée was recently honored with a Double Gold Medal at the 2009 San Francisco International Wine Competition and a Best in Class at the 2009 Monterey County Fair Wine Challenge Competition. These small lot wines sell out quickly, and eager visitors will appreciate the fact that Kiamie Wine Cellars recently opened a tasting room in the historic Granary Building in downtown Paso Robles. Happily, now more wine lovers can enjoy the blended best of Paso's west. From Hwy 101, exit at Paso Robles St. Turn left onto 13th St, then immediately turn left on Riverside Ave.